There are only a few days left in the NHL’s regular season and today is a big one. Twelve games grace the schedule including several that have huge implications. The Colorado Avalanche could clinch a spot in the Western Conference by getting a single point and the Carolina Hurricanes could do the same with a win and some help, while the Montreal Canadiens are hoping to keep their win streak going and put some pressure on the idle Columbus Blue Jackets. As teams prepare for the action, we’ll be here keeping track of all their minor moves. The Chicago Blackhawks have returned Dennis Gilbert to the minor leagues after giving him his NHL debut. The 22-year old defenseman played just under 13 minutes last night and managed to record six hits and two penalty minutes. He’ll rejoin the AHL’s Rockford IceHogs as they try to chase down a playoff spot. Ryan Lindgren is on his way back up to the New York Rangers to close out the year. When the Rangers initially recalled the promising defenseman back in January, many assumed he would remain at the NHL level through the rest of the campaign. That hasn’t been the case though; Lindgren played in just three games with New York before returning to the AHL’s Hartford Wolf Pack. He should start the Rangers’ final two games however, better late than never. The Anaheim Ducks have made a flurry of moves as they count down the final days of a disappointing season. Forwards Kiefer Sherwood and Chase De Leo and defenseman Jake Dotchin have been reassigned to the AHL’s San Diego Gulls, as a playoff run for the affiliate is more important at this point than the final games of an NHL team with little to play for. The Carolina Hurricanes won’t be signing Adam Fox this summer, meaning the team has to consider trading his rights at some point in order to receive some sort of compensation before he becomes an unrestricted free agent in August of 2020. If they can find a team that he’s willing to sign with in time for the 2019-20 season, they may be able to coax some value out of them by leveraging the idea of getting him a year early. That’s a tough idea to sell given that teams could just wait a year and try to convince him themselves without giving up an asset, but the Hurricanes are certainly going to try. Owner Tom Dundon told Chip Alexander of the Raleigh News & Observer that the team would try to trade him, and today Pierre LeBrun of The Athletic (subscription required) examined the situation further. Interestingly, LeBrun notes that the league would void a sign-and-trade situation that was meant to burn the first year of an entry-level contract in 2018-19. That was the immediate speculation surrounding the situation, and a potential selling point for the Hurricanes when bringing deals to other teams. The Hurricanes have talked to the New York Rangers about Fox—who grew up a fan of the team—but LeBrun believes that Carolina would be looking for a late first-round pick in exchange for the Harvard defenseman. That’s obviously a big price for the Rangers or any other team to pay just to get their hands on a player’s rights, especially when he will become an unrestricted free agent down the road. It is important to remember here that Fox will be turning 22 in February of next year, meaning if he goes back to school he will only be required to sign a two-year entry-level contract with whatever team he chooses in free agency in the summer of 2020. Right now he would have to ink a three-year deal, meaning he’s going to get to restricted free agency—and a chance at a bigger payday—in the summer of 2022 either way (unless of course Carolina can somehow convince him in the next few days). Rangers winger Pavel Buchnevich is in concussion protocol, reports NHL.com’s Mike Morreale (via Twitter). He left Sunday’s game against Philadelphia late with the injury and while they were hopeful he’d suit up tonight, that wasn’t the case. Buchnevich, a pending restricted free agent this summer, has 37 points in 61 games this season. With St. Cloud State getting upset by American International on Friday night, quite a few undrafted free agents of note are expected to make decisions on where they’re going to sign in the coming days. It appears that one has already made that choice as Sportsnet’s Elliotte Friedman reports (Twitter link) that forward Patrick Newell will be signing an entry-level contract with the Rangers. The 23-year-old had a dominant senior season, scoring more goals (21) than his first three years combined while also setting a career-best in assists with 26. That helped him earn a spot as one of the ten finalists for the Hobey Baker Award for the top NCAA player. The Rangers have had some success in the college free agent market in recent years with defenseman Neal Pionk, winger Jimmy Vesey (after being unable to agree to terms with Nashville and Buffalo), and center Vinni Lettieri being among their recent additions that have already made their mark at the NHL level. Seeing other college free agents get a chance to play quickly certainly bolsters New York’s bargaining power and it appears it has helped them land another notable one in Newell. In the meantime, decisions will be pending for undrafted free agents Jimmy Schuldt (defenseman, senior), Robby Jackson (winger, senior), and potentially Blake Lizotte (winger, sophomore). The Canadiens are also expected to try to convince center prospect Ryan Poehling (junior) to turn pro instead of returning for his final season. As a result, there should be plenty more news coming out of St. Cloud State in the near future. While the Rangers won’t be able to bring 2018 first-round pick Vitali Kravtsov over to finish off the season, GM Jeff Gorton told reporters, including Peter Botte of the New York Post, that he plans to talk to Kravtsov’s representative soon in the hopes of securing an entry-level deal for next season. His KHL deal runs through April 30th and even though his KHL team in Traktor Chelyabinsk has already been eliminated from the playoffs, they won’t release him from his deal early. The 19-year-old had 21 points in 50 games this season while transitioning to play down the middle. The Rangers are leaning towards shutting winger Jesper Fast down for the remainder of the season, reports Larry Brooks of the New York Post. He has been playing through a shoulder issue for the past three months before the team gave him a night off earlier this week against Detroit. With New York squarely out of the postseason picture, it wouldn’t make sense for them to keep running him out there when he’s not fully healthy. The 27-year-old is already signed for next season with a $1.85MM cap hit. We’re really happy to have Chris serving as general manager of our team. He knows what it takes to succeed at the international level, and working with our men’s national team advisory group, which brings vast experience, success and passion to the table, we have a tremendous group in place to build our team. That advisory team is made up of several active NHL front office executives, including Drury’s boss in New York Jeff Gorton. The group will decide who will play in the upcoming World Championship, scheduled for May 10-26 in Slovakia. Drury has plenty of experience on the international stage, winning two Olympic silver medals and taking part in several other tournaments throughout his excellent playing career. The Kootenay Ice have moved to Winnipeg for the 2019-20 WHL season, and will get a nice prize to start their run in the new city. The team today won the WHL Bantam Draft lottery, moving up one spot to get the first overall selection in the upcoming draft. The Prince George Cougars will pick second (with Swift Current’s selection) and fourth, while the Saskatoon Blades will be the third team up. Kelowna rounds out the top five of the draft, which will be held on May 2. Unfortunately they won’t get a chance to pick Matthew Savoie with the top selection, as the 15-year old was denied exceptional status. In response to that, Savoie committed to the University of Denver for 2021-22, something his brother had already done previously. If he wants to maintain his college eligibility, Savoie will not be able to play anywhere in the WHL and instead will likely go the route of the USHL. That is, unless a favorable situation comes about at the 2020 bantam draft and he rescinds his commitment. It’s not very often that a team decides to dismantle their team quite as thoroughly and openly as the New York Rangers have over the past year. Starting with a letter to their fans in early February 2018, the Rangers’ front office explained that they did not believe the roster as then constructed was going to bring any realistic success or a chance at a Stanley Cup. Just a few weeks later the team began selling off their biggest assets, dealing Nick Holden, Michael Grabner, Rick Nash, Ryan McDonagh and J.T. Miller in the span of just a few days. After that kind of a deadline, it was obvious that the Rangers wouldn’t stop there. This season’s deadline brought much of the same, as New York jettisoned Mats Zuccarello, Kevin Hayes and Adam McQuaid for almost entirely future assets. One name that was brought up repeatedly but never moved however was power forward Chris Kreider. Kreider represents the last member of the former core with an expiring contract, as his deal is up following the 2019-20 season, and now sits as the biggest decision the team must make this summer. The talented winger will turn 28 in April, and could be an extension candidate if the team believes he can help them get back to the playoffs with their rebuilt lineup. He could also be their biggest trade chip at the draft if they want to take another step backwards to build the prospect cupboard up. In fact, Larry Brooks of the New York Post writes that there is “not even the slightest chance” that Kreider will report to Rangers training camp in the fall without an extension, implying he would be traded without one. That decision will come after a potentially career-best season from Kreider, even if it has come with some ups and downs. The 6’3″ forward is just two goals and four points from his previous highs, both set in 2016-17 on a team that finished with 102 points and made it to the second round. There would certainly be a lot of teams lining up for his services if available, given his 30-goal potential and all-around effectiveness. Hayes, for instance (who admittedly is a center) has never scored 50 points in a season but landed the Rangers a good young player and first-round pick even as a pure rental. The fact that they potentially could get more than that for Kreider with a bigger market may be too much to pass up. But at some point, the team will have to decide if they’re ready to compete again. A multi-year extension for Kreider, expensive as it may be, may help the team do just that in the next few years when young players like Brett Howden, Lias Andersson and Filip Chytil are still on their entry-level deals. There’s plenty of talent in the system now for New York, and it may be time to start retaining it instead of cashing it in. 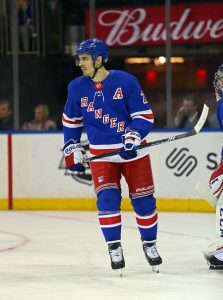 For now, Kreider and the team will focus on finishing out the season strong and without injury—something the forward has battled for much of the season, according to Brooks—while developing their young players at the highest level. But come this summer there will be a point where GM Jeff Gorton and his staff will have to decide when the next phase of the plan is scheduled for, and if Kreider is a part of it.